Everything Must Go – at once a sales pitch and a surrender to fate – is a perfectly apt title for this melancholic yet entertaining film that dismantles the structures, behaviors and relationships we have come to consider normal. 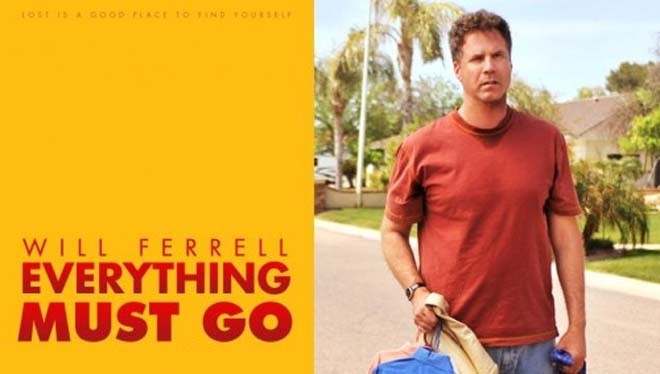 So starts Everything Must Go, a wryly humorous drama starring Ferrell, which examines five endless days in the life of a man who believes he has lost everything. 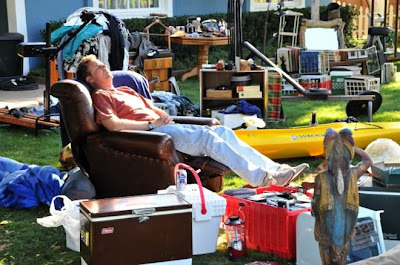 Deciding to both fight and give up, Nick appropriates the object-laden lawn as his living room; he stations himself in a recliner and entertains himself with neighbor-watching, while steadily chipping away at his six-month sobriety. When the police show up to shut down the illicit spectacle, he invokes a legal loophole that buys him four more days of lawn-time: residents of Plano, Texas are permitted to hold private yard sales for a maximum of five consecutive days. When I interviewed Andrew Greenblatt (Executive Director, Philadelphia Film Society) earlier this month about his screening choices at Tribeca Film Fest (click for post), he said he went again to see Everything Must Go. I said, "Oh, is it that good that it's worth a second screening?" I don't remember his exact response, but he looked at me quizzically, and I knew that I'd missed something. What I was missing was the fact that Andrew is an Executive Producer on this film! He, along with creative partner, Marc Erlbaum. Oh well, I may be the blogger, but I can't be expected to know everything. I now have "liked" Nationlight Production's facebook page, so hopefully I'll be more informed going forward. One thing I got the timing right on was reading “Why Don’t You Dance? ", the Raymond Carver short story the movie is based upon. Actually, it was read to me. I went on holiday for the Memorial weekend, and my friend brought along a collection of different short stories to read in the car; knowing we would need entertainment while sitting in the crawling, one lane traffic of route 27 through the Hampton's and into Montauk NY. By coincidence, this story was among the choices. Of course, anytime a short story is adapted into a feature length film, a lot of liberties and expansions must be made. And "Why Don't You Dance?" is a short, short story. However, the movie does not retain the odd, dark, mysterious quality of Carver's tale. It can't be helped, the movie must give a back-story to "the man" drinking and selling things on the front lawn. 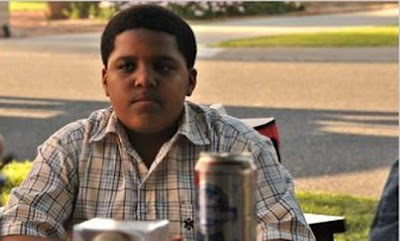 And in the story there's certainly no Kenny character, (Christopher Jordan Wallace) the sweetly sage and patient young boy played so naturally by Notorious B.I.G's son. Director Dan Rush, cast Wallace in the role of Kenny based upon his performance in his father's bio pic, Notorious. Wallace hadn't been looking to do more acting. He only did Notorious because his grandmother thought he should play the part. But it would seem now, the acting bug has well and truly bitten this young man. Everyone wants to talk about the fact that Will Ferrell has done a film that's such a departure from his comic origins. But I don't really get all the fuss; it's common knowledge that comedy is far more difficult to do than drama and that behind every funny man, lurks a Pagliacci. It was the same discussion the first time Jim Carey decided to do a part that didn't require him to be over-the-top hilarious or see him twist and contort his person. Ferrell's performance in Everything Must Go does stay true to his man/baby persona, it's just a bit more broken and a lot more I don't give a F*&% anymore. The film is primarily about hitting rock bottom and and saying to the Universe "fine, I won't even try anymore"; but at the same time, wanting others to see you and share in your pain. Therefore, I get that this is why he decides to just stay in his front yard, but there is a scene with his pregnant neighbor, Samantha (Rebecca Hall) that takes place in his backyard, which has a fence and some privacy - I kept thinking, why doesn't he at least muster enough effort to drag his chair and some of the more valuable items into the backyard, instead of being completely on display? But of course, that kind of practical thinking, really wouldn't make much of a movie, would it?